News | BetOTG | Bet On The Go! 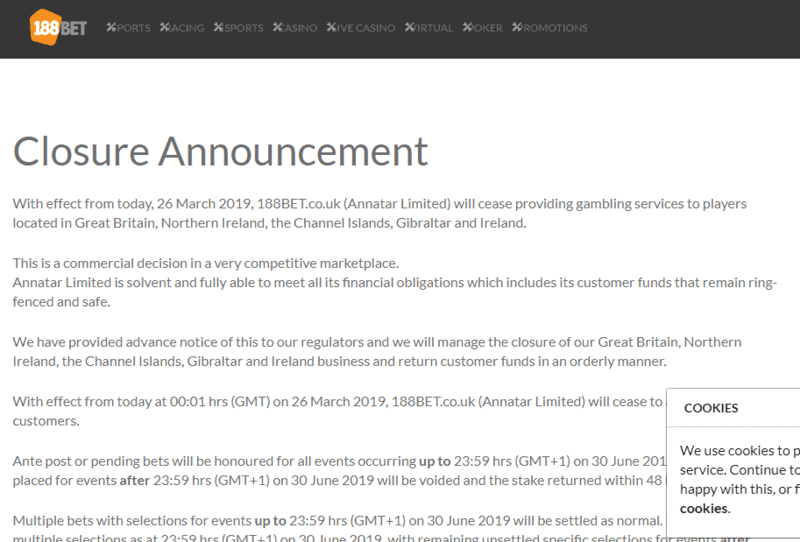 Specialist bookmaker 188Bet has decided to cease operating in UK and IRE markets. 188Bet website with it’s shutdown notification. Any existing 188Bet customers that still have funds in their account fear not! You can still withdraw any outstanding balance by logging into your account and requesting a transfer into your bank account. But you must do this before 23:59 hrs (GMT+1) on 30 August 2019. While 188Bet does not state what will happen to any outstanding funds after this date, it is prudent to ensure any remaining funds are withdrawn before this date. All pending single bets on all events will be honoured up to 23:59 hrs (GMT+1) on 30 June 2019. Any bets placed after this time will be null and void and the stake returned to the account within 48 hours. Any multiple or accumulator bets will also be honoured up to the afore mentioned date stated. For those with multiple selections bets with events that exceed 30th June 2019 will see those specific selections void and any winning events settled within 48 hours. 188Bet burst onto the sports betting scene in 2006 with the prospect of providing customers with specialist in-play markets. 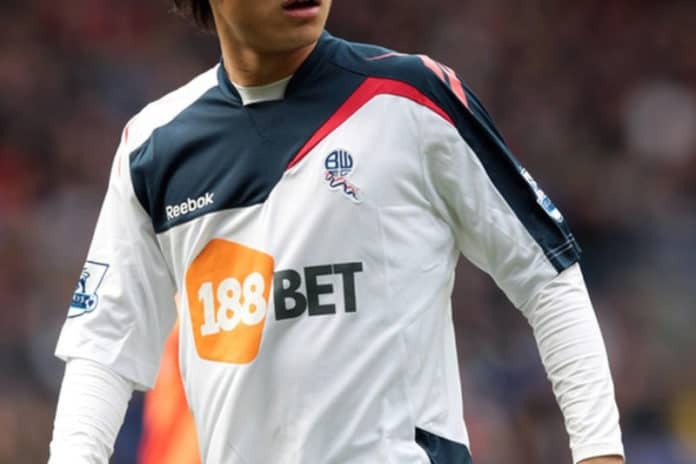 They were the first sports betting site to sponsor two Premier League clubs in Bolton Wanderers and Wigan Athletic, and had a diverse sponsorship portfolio across all sports including rugby, cricket and golf. But since then they have struggled to adapt in a highly competitive market, with new bookmakers muscling in and existing ones raising the bar with new and exciting features. This is now the second bookmaker to shutdown this year. The news comes as the gambling industry faces some headwinds due to tighter regulation by the Gambling Commission. It forces bookmakers to comply with new guidelines and ensure third party affiliates are being monitored and comply with those guidlines. Any breach of these new regulations will result in hefty fines which we’ve seen recently with Skybet and William Hill. Is this the last we’ll see of 188Bet in the UK and Irish betting market? I believe the company will re-think their strategy in the UK and IRE and bring a fresh new product to market that is fully compliant with regulators. It may take some time, but this isn’t the last we’ve seen of 188Bet. They may be late to the party. But BetVictor PriceItUp Builder has been worth the wait! Here we’ll go through some of the key features that puts PriceItUp Builder head and shoulders above the rest. We’ll also show you how to place your very first PriceItUp bet with screenshots to make it nice and simple. What is PriceItUp Builder Bet? BetVictor Priceitup is a tool that allows you to combine odds from multiple outcomes onto one single bet. This gives you greater flexibility to create your own unique custom bet slip with mouth-watering odds if it pays off. Where previously you would have placed individual odds for each of the outcomes, now you have the option to combine these odds to increase your winning potential. First thing you’ll need a BetVictor account. That’s a 600% bonus on your first deposit! Simply bet £5 and you’ll receive 2x £10 free bets and a £10 exclusive casino bonus. All bonuses come with a 40x wager requirement and will expire within 7 days, so make sure you use them asap. For this and all of their terms and conditions, refer to BetVictor T&C’s. Now that you’ve signed up, we’re ready to place you first Priceitup bet builder. So the first thing you need to do is to log into your BetVictor account. The layout for mobile and desktop varies slightly but in principle it’s the same. For this example we’re using the mobile platform. Find the game you want to bet on by selecting Competitions on the top menu bar and scroll down to find the league/competition you’re interested in. Now scroll down past the current markets and odds and you’ll see the New #PriceItUp Builder further down. Tap on the Lets Try It button and you’ll move into the new custom screen where you’ll find hundreds of betting options for your chosen match. As you add each option to your bet slip, you’ll notice the total odds increase with each addition. Once you’ve added all of the odds to your bet builder, enter your stake and hit the Place Bet. You’ll now receive confirmation on the screen the bet has been placed, with a list of the bets you have placed. You will also receive an email notification as receipt. All bets relate to 90 min markets (unless explicitly stated). If any part of the best is void, the whole bet becomes void. BetVictor reserve the right to cancel any bets that are priced wrong. Max payout of £10k per customer on singles market and £100k on multiple markets. For a complete list of terms and conditions, see the main BetVictor Price It Up Bet Builder page. BetVictor’s development team certainly know what they are doing. 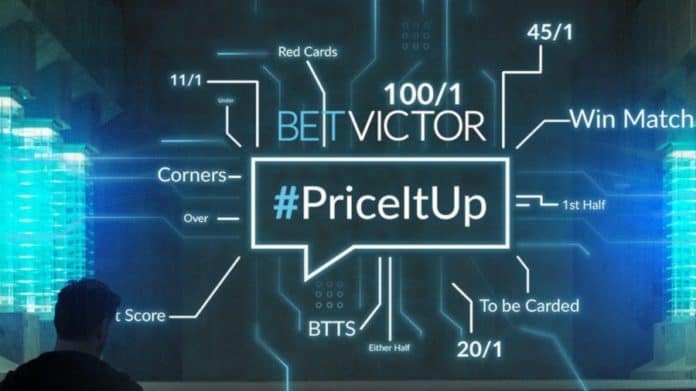 The integration of BetVictor PriceItUp into their existing sportsbook platform is flawless, with a focus on enhancing the user experience with intuitive design, rather than carelessly bolting on a feature for the sake of it. It’s clear to see that time has been taken to develop this new feature and it has paid off hugely. I can’t wait to see what innovative product BetVictor comes up with next. It’s hard to believe we’re in March already! This month is normally pretty quiet for new casino bonuses, as companies organise their balance sheet as we reach the end of the financial year. But we expect to see a deluge of offers and new promotions at the end of April. In the meantime do not despair, we’ve crawled through the gambling we and found a few old favourites with some incredible offers, as well as some “jaw dropping deals”. If you’d like to receive our casino bonus deals dropped into your inbox every month, then why not subscribe to our newsletter which you can find on the sidebar or at the bottom of the page. 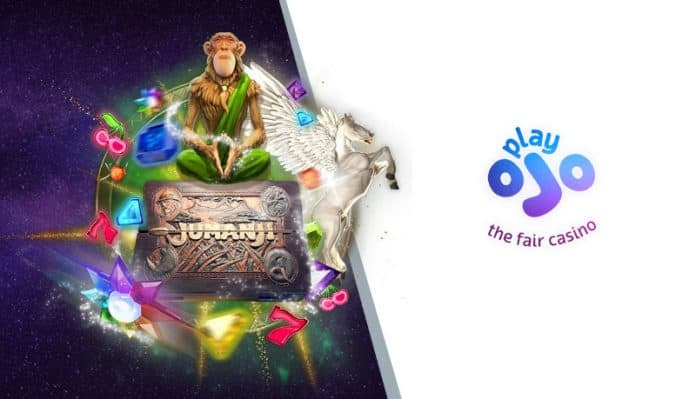 Play OJO have mixed things up recently by offering new customers up to 50 Free Spins on their first deposit. This might not sound like much, but given that the casino has a no wager requirement policy on all bonuses with customers, it’s actually a pretty sweet deal. On top of this there’s also no limit to what you can win and any winnings are paid out in cash. It’s no wonder they’ve won countless awards for their fair play policy. Minimum deposit is £10 for this offer and you receive 1 Free Spin for every £1 you deposit, so you need to deposit £50 to get the maximum number of free spins. To celebrate the arrival of Viking Wilds on their platform, Royal Panda are giving all new and existing players a chance to earn up to 150 Free Spins from 6th to 20th March. To receive Viking Wild Free Spins you simply need to deposit £10 into your account to get 10 Free Spins the following day by noon CET. Deposit £10 each day between 6 – 20th March to earn all 150 Free Spins, it couldn’t be simpler! If you’re looking for even more Free Spins then this months offer from Vegas Paradise is just for you. Vegas Paradise are offering new players 5 Free Sign-up Spins just for joining. You can also earn 15 free Spins on your first deposit and 25 free Spins on second and third deposits each. 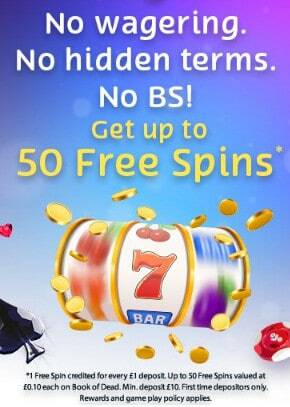 Giving you a generous 70 Free Spins to get you started. Finally, for all you savvy punters looking for a free lunch, we’ve got 10 Free Spins with no deposit from Jackpot Fruity. Simply register an account which normally takes less than 3 mins and the spins are instantly added to your new account. Jackpot Fruity also has one of the biggest matched bonus offers you’re likely to find. You can earn up to £1,500 + 25 Free Spins across your first 3x deposits. 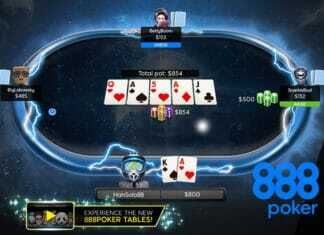 Pokerstars has one of the best poker platforms on the planet. But if you’re a crypto gambler wanting a seat at the table, you can’t deposit directly via Bitcoin. 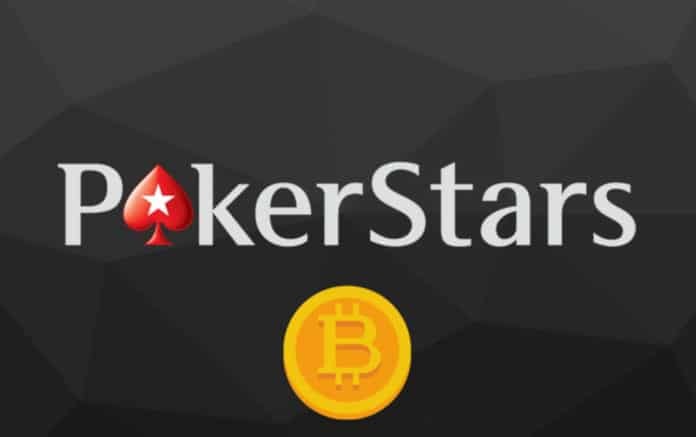 Without knowing it, Pokerstars has inadvertently opened its doors to Bitcoin holders. 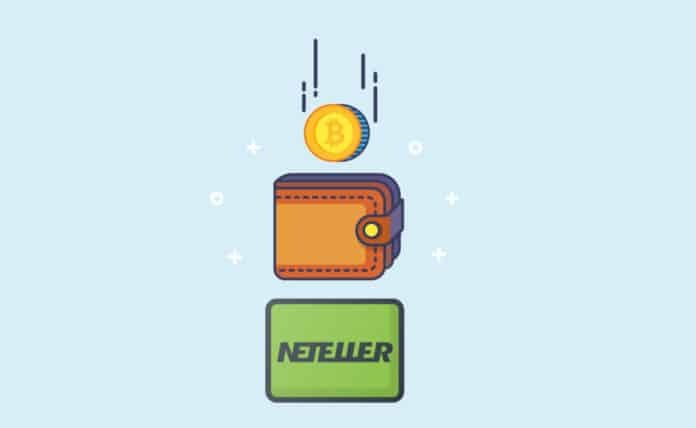 Well by adopting a new payment service Neteller, Pokerstars accepts Bitcoin and all other major crypto currencies indirectly. In this article we’ll show you how to do this with a simple quick start guide as well as step-by-step screenshots. Plus we’ll highlight some of the key terms, as there are a few gotchas you need to be aware of before making a deposit. While researching this article I found that NONE of the top 20 online bookmakers allowed punters to directly deposit via Bitcoin. Or worst case they could go bust overnight! And it’s not just Bitcoin that Pokerstars now accepts. In fact Pokerstars now accepts seven of the major crypto currencies on the market, thanks to Neteller. But there’s one mobile payment that is 10x better than Neteller! It’s not only quicker and simpler to use, but has enhanced authentication – to avoid your banking details hacked. Find out why I prefer BOKU phone bill deposits over ANY other mobile payment and change the way you deposit funds. The first thing you’ll need is a Pokerstars account. Before you transfer any funds you’ll need a Neteller account. 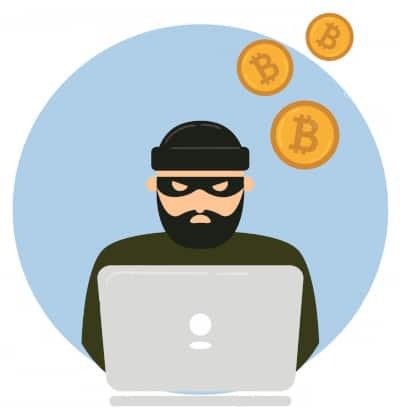 Creating an account is relatively simple, but you will need some form of ID verification, before you can transfer any Bitcoins. You can do this quickly by connecting via your Facebook account, or take a photo of either your passport or drivers licence and upload the image. Verification is normally pretty quick and then your good to go! The next thing you’ll need is a Bitpay wallet App on your phone. I’m assuming that since you are here that you already have this setup on your phone. 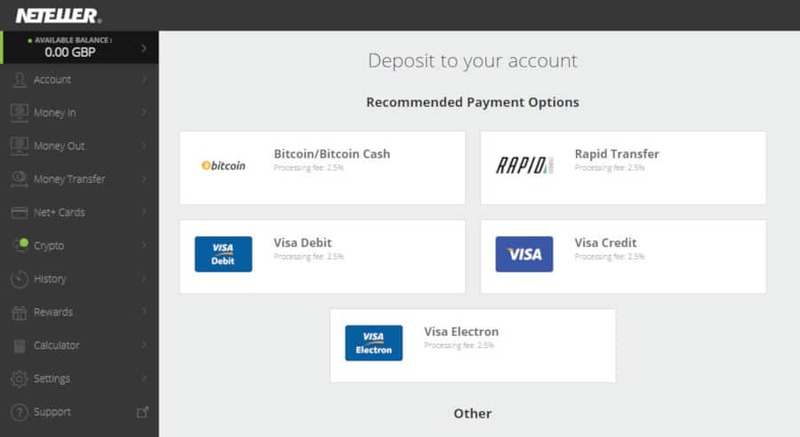 For more details on how to do this you can checkout Bitpay’s setup guide. Sign into your Neteller account and select Money In from the left sidebar. Click on the Bitcoin/ Bitcoin Cash icon. 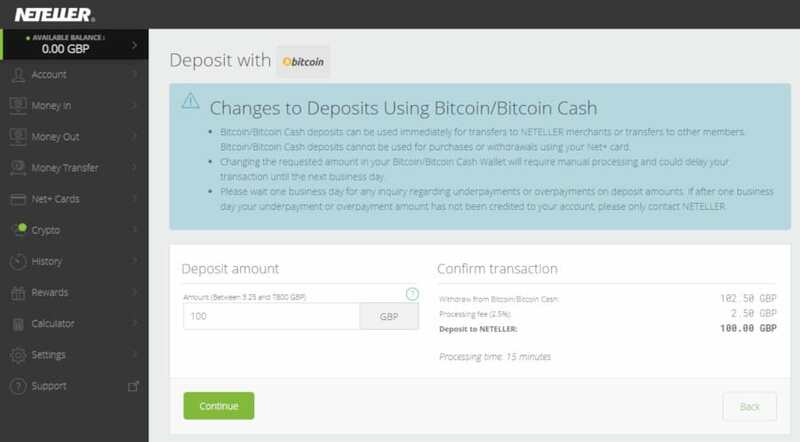 One the Deposit with Bitcoin page, enter the amount you want to deposit into your Neteller wallet and click the Continue button. 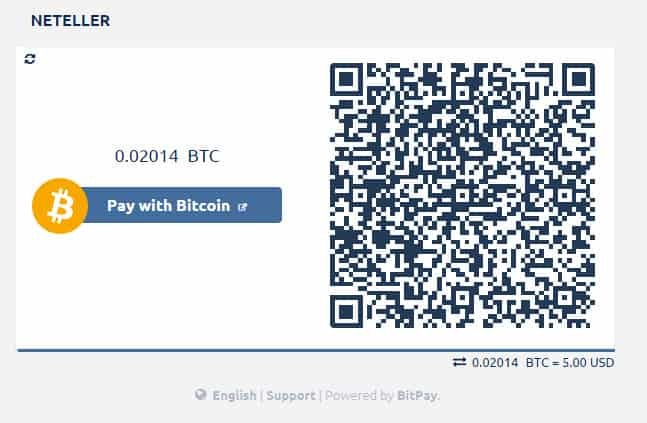 You will now be re-direct to Bitpay, enter your email address to continue. Select which crypto currency you want to use, which in our case is Bitcoin. Laptop Users – Scan the QR code using your phone. You will now be redirected to your Bitpay wallet to complete the transfer. Once this is done the funds may take up to 15 mins before they are displayed in your Neteller account. Processing times can take up to 15mins. There is a 2.5% processing fee to transfer funds. 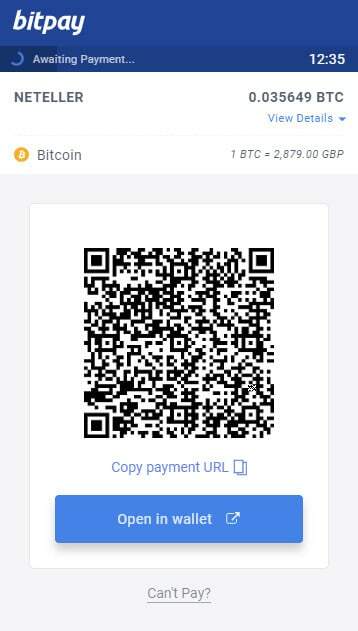 Don’t forget additional blockchain Network Costs which can range between £0.10 – £0.15. £10 minimum deposit to Pokerstars. How long will it take to transfer the funds? This is entirely dependant on the blockchain. In the past it can take up to an hour to transfer coins into Neteller accounts. But with the introduction of the Lightning Network this has come down significantly to less than a minute. Are there any fees to deposit Bitcoins to Pokerstars? 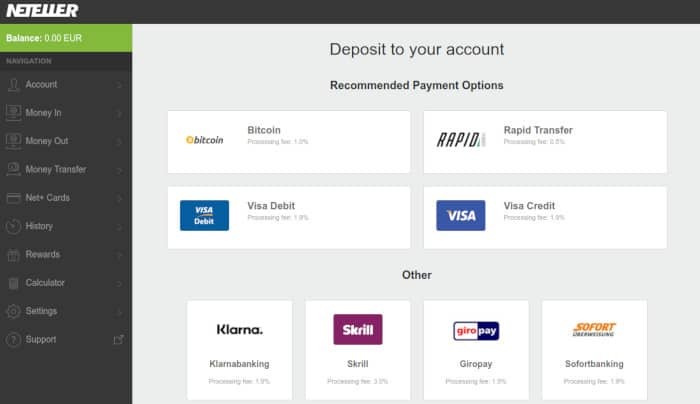 Yes, you’re charged 2.5% + Network Costs of approx £0.15 to transfer funds from your Bitpay wallet to Neteller. So if you deposit £100 your total cost will be £102.65. 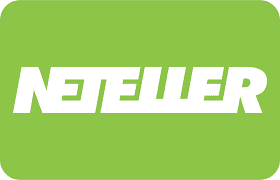 While there are no fees to transfer from Neteller to your Pokerstars account, you will be charged to transfer any winnings back to your Neteller ewallet. So why do gambling sites shy away from Bitcoin? From it’s meteoric rise and price crash, to lost or stolen coins, Bitcoin has been in the media for all the wrong reasons. I think crypto has been unfairly targeted by the media and used as clickbait, but you have to see this from their prospective. Adding existing mobile payment services such as Paypal and Neteller that are already regulated by the FCA makes more sense, than rolling-your-own based on crypto platform. It would add a huge upfront cost to setup and maintain, it simply isn’t worth it for gambling sites. OK so maybe it was slightly misleading to say that Pokerstars now accepts Bitcoin, as it requires an intermediary payment system (Neteller) to act as a proxy to move money around. Be aware of the potential hidden fees to transfer funds to Neteller. Personally I would only use this deposit method as an option of last resort, if you enjoy gambling and want to spend your Bitcoins. 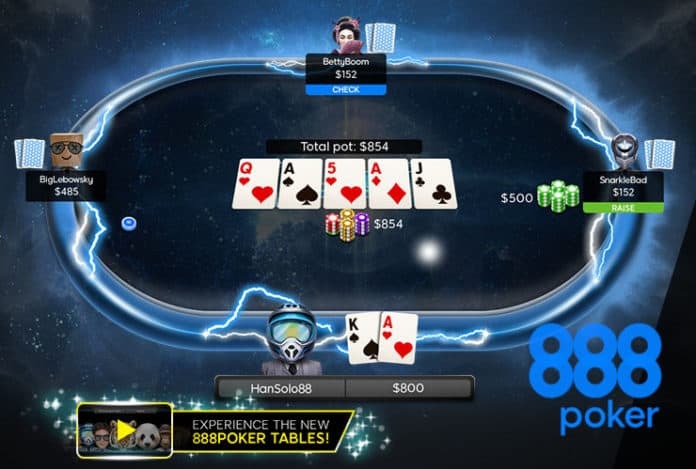 But I still think this a great back-door for crypto gamblers that want to spend their hard earned coin/tokens on one of the best poker platform on the market. 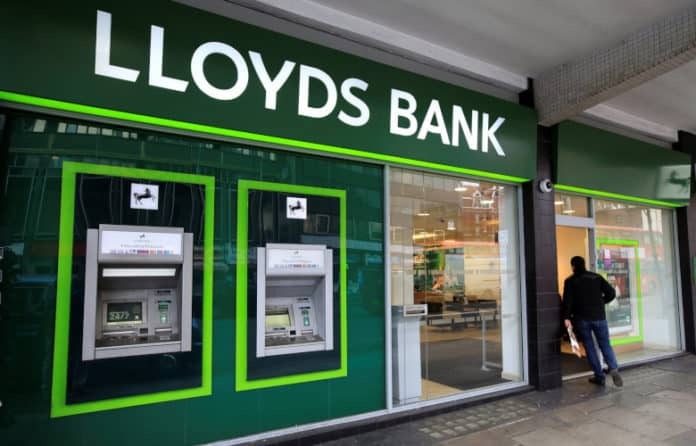 Three major UK banks RBS, Lloyds and Santander have joined Barclays in an effort to introduce responsible gambling measures by blocking transaction payments to bookmakers. The scheme would allow problem gamblers the option to opt out of allowing payments to any company that is associated to gambling and issued a UKGC licence. Most readers will have a banking app of some sort on their phone for viewing their transactions. The new app would include a “gambling block” feature to enable self exclusion, in an attempt to protect vulnerable punters with compulsive behaviour. The exclusion would also apply to high street bookmakers as well as online gambling sites. Barclays released a similar blocking feature across all digital platforms back in December, which restricted debit card spending in a number of categories including restaurants and takeaways, supermarkets, petrol stations, adult entertainment, pubs & bars and petrol stations. Enhancements to the mobile apps which would restrict payments to gambling related properties should be implemented within weeks. “The new card controls give customers more control over debit card transactions. “We recently launched the ability for our customers to freeze their credit cards and set spending budgets using our mobile app. While this option is a step in the right direction more needs to be done to tackle the issue of gambling addition that affects the minority of punters with addictive personalities. The measures introduced by the major banks do not go far enough as these limits are self-imposed and are easy to remove within 24 hours. More need to be done to introduce a cooling off period which would increase the time between initiating the gambling block and when it’s possible to remove this option. The decision comes just a month after the UKGC recommendation to remove gambling advertsing during live football events. With both measures being rolled out, it will hopefully help punters with gambling issues to self exclude themselves and avoid the temptation altogether. The undisputed champion of punter value is back with even more prizes. 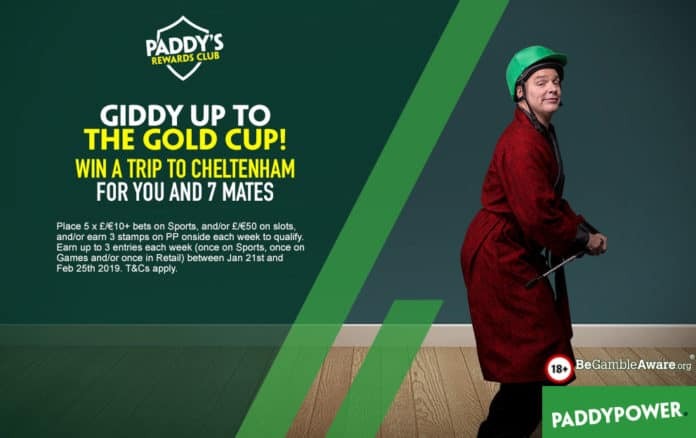 This time Paddy Power is giving it’s Rewards Club members a trip of a lifetime to the Cheltenham Gold Cup 2019 on March 15th. Not only that but you get to invite SEVEN of your best mates to join the action in a private box and soak up the atmosphere at this epic race track. On top of that you’ll also get a free £1,000 bet to place on the Gold Cup race. And you Paddy’s giving you an extra grand spending money on the day. What that’s not enough? You want MORE!? OK, how about your own private box and complementary bar to enjoy all the days racing, along with lunch and champagne to celebrate what will be a momentous day. As well as this you’ll also get accommodation and private transport to scoffer you between venues, so you don’t need to worry about a thing, Paddy has got you covered. 2 nights stay for you and SEVEN guests! So how do I take part? If you’re not a VIP member already, you need to join Paddy Powers Rewards Club. Each week Rewards Club members can earn a £/€10 Free Bet EACH WEEK when you place five £/€10+ of odds greater the ½ (1.5). Place 5 x £/€10+ bets on Sports and/or £/€50 on slots and/or earn 3 stamps on PP onside each week to qualify. 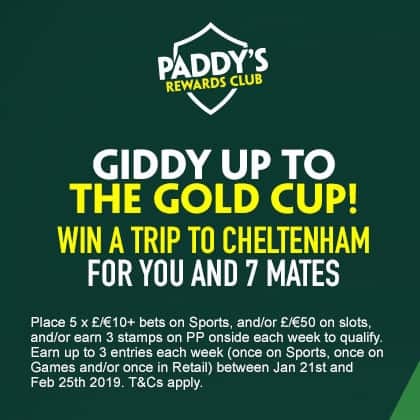 Earn up to 3 entries each week (once on sports, once on games and in-store) between 21/01/19 to 25/02/19. T&C’s apply. To signup you simply need to opt-in via the Rewards Club (banner above) and you’re good to go. Place five £/€10+ bets on sportsbook or stake £/€50 on slots and earn 3 qualifying stamps. You can qualify up to three times a week across all platforms (sportsbook, slots and in-store) to earn 3x entries, up to a maximum of fifteen entries over the qualifying time period. Exclude or limit this promotion to specific customers. If a winner cannot be contacted within 48 hours, Paddy Power will select a new winner. Withhold any prizes on grounds that the winner does NOT meet the eligibility requirements specified. Modify the terms and conditions at any time. When is the competition valid? The competition is valid NOW in weeks between 21st Jan to 25th Feb 2019. The prize draw will take place on Tuesday 26th February 2019. Be sure to read Paddy Power’s terms and conditions before making any qualifying bets. Paddy’s loyalty schemes have gone through more face-lifts than the big-man himself. But we think the cheeky bookmakers latest incarnation, Paddy Power Rewards Club is their best offering to date. The best thing thing about PP Rewards Club is that you don’t need to be a high-roller or a member of the Freemason’s to join. What is Paddy Power Rewards Club? 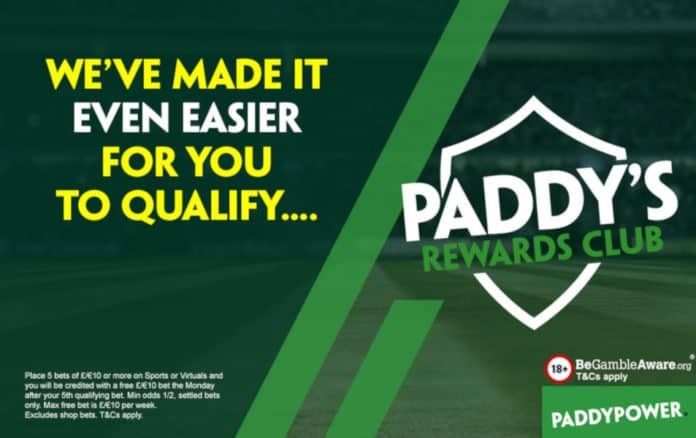 It’s simply a rewards scheme for new and existing Paddy Power customers that rewards you with money back as you place bets. 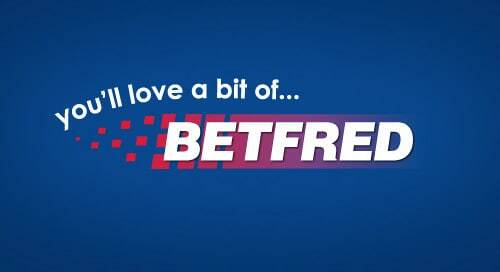 Punters that place 5x bets of £10 or more, with odds of ½ (1.5 decimal) will receive a free £10 bet. The offer is available on all sports and markets and also includes single and multiple bets. This is particularly beneficial for regular punters that place multiple smaller bets between £5-£10. It’s only available online and are subject to terms and conditions, which we’ll discuss below. addition to this Paddy has monthly prize draws that are exclusive to Rewards Club members. This month you can win a trip to the Cheltenham Festival for you and seven mates. To bag the prize all you need to do is place 5x bets of £10+ to earn 3 stamps which go towards the draw. This is yet another great reason to join the PP rewards Club. Well first thing you’ll need is a Paddy Power account. Currently Paddy Powers €/£20 Risk Free is available to all new customers. Simply place a bet of €/£20 on any market and if you loses Paddy Power will refund your stake in CASH. You won’t find a better deal with any other bookmaker. But that’s not the only deal that Paddy Power has to offer, check out our complete list of Paddy Power bonus codes if you’re looking to deposit more. How do I join Paddy Power Rewards Club? 1. Click on the Rewards Club landing page. 2. Select the Opt in icon. 3. You’re good to go! To receive your £10 free bet you just need to place five bets or more of £10+ and the free bet will arrive into your account the following Monday. Terms and conditions: Odds of ½ 1.5 (decimal) or greater. Free bets are credited by 12pm on Monday. But its not just on sports betting where you can earn money back. Slot players can also benefit from money back while they play. New and existing players can earn a Free £5 bet when you stake £50+ on slot games. This is in effect 10% cash back on any stake you place which shouldn’t to be sniffed at. When should I receive the money back? Provided you have qualified by placed the relevant bets, the money should arrive into your account the following Monday by 12pm. Yes! This offer is also available to the average highstreet punter, but with slightly different terms. If you’re interested speak to one of the cashier members of staff in-store for more details. Following several incarnations, I finally feel that Paddy has nailed it on the head with Paddy Power Rewards Club. The offer is excellent news for frequent punters, but I wouldn’t recommend this for casual gamblers as it may encourage you to place more bets than you want to. This will only really benefit regular punters. The tie-in with big competition prizes is the icing on the cake for me and puts this loyalty scheme head-and-shoulders above all other bookmaker. The new year is always a great to grab yourself a bargain. BUT it’s not just the highstreet that has great offers. Casino sites are all jostling to sign-up new players, so much so that they have some pretty fantastic offers to exploit. This month we’ve listed the best casino bonus offers for Jan 2019. We’ve got some “old boys” you know and love, as well as some newbie casinos with incredible new customer promotions to take advantage. Shortlisted by our editor as Best Casino Newcomer of 2018, Slotty Vegas is an ultra-modern site that’s been design with user experience in mind, checkout our in-depth Slotty Vegas review to find out more. New customers can take advantage of Slotty Vegas Welcome Pack £/€ 350 + 135 Spins. This offer is across your first 4x deposits so i’ll break each deposit down so you know what to expect. Conquer has an indie feel to it and works great on mobile. This month they’ve got an offer you can’t refuse. New players can get 15 Wager Free Spins on their first deposit and a 200% match bonus up to £50. Wager Free spins can only be used on Fairy Tale Legends (which isn’t great news), but don’t look a gift horse in the mouth! You can also earn an extra 200 free spins on your second deposit. You won’t believe the all new Monster Casino site, it looks simply incredible with an all-new menu system infused with awe inspiring graphics, seeing is believing. 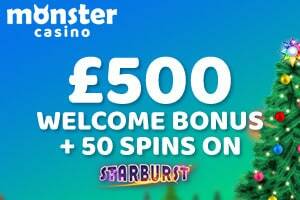 New players can claim up to £500 Welcome Package and 50 Free Spins on Starburst. Don’t miss out on this cracking offer. This is yet another casino that’s part of the Netkan Group . The theme is fresh and clean and there’s plenty of cool slot titles to entice you in. Slotstars are giving new customers 10 Free No Deposit Spins. Simply open an account and the free spins are yours to play. While you’re there why not take advantage of the latest promotion: £500 Welcome Bonus plus 100 Free Spins on Cleopatra. With a huge catalogue of slot titles to choose from, there’s enough there to keep you going right through jan.
Last buy not least is a firm favourite of mine BGO, who are giving players an offer every day through-out January. 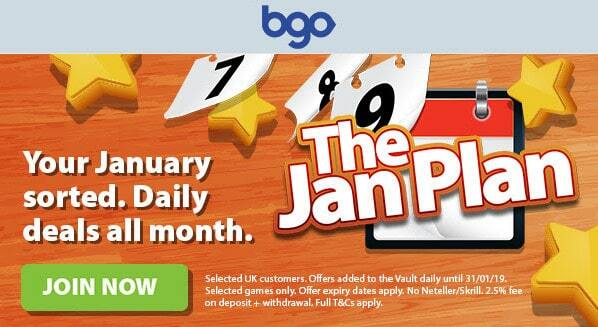 The Jan Plan offers punters the chance to earn Double Diamonds on selected games every day. Not only that but you also get a chance to see what surprise offers are in The Vault. Within the vault you’re given a bauble, click on this to reveal your special offer. This promotion is valid until Jan 31st 2019 and available to new and existing players.